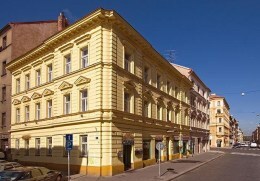 Are you looking for a comfortable accommodation in Prague ? Then you are on the right site ! This in 2009 completely renovated 3-store building with own elevator consist of an apartment and a B&B room. This beautiful accommodation is located in the center of Prague in a quiet, central location, between the two famous parkland gardens Stromovka and Letenské Sady, with good access to public transport. The nearest tram station is only 50 m away and the metro is just 5 minute walk away.